A cave is a hollow place in the ground, specifically a natural underground space large enough for a human to enter. Caves form naturally by the weathering of rock and often extend deep underground. 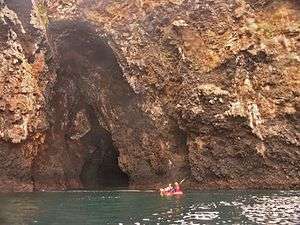 The word cave can also refer to much smaller openings such as sea caves, rock shelters, and grottos. A cavern is a specific type of cave, naturally formed in soluble rock with the ability to grow speleothems. 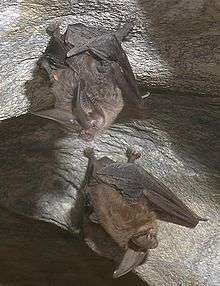 The formation and development of caves is known as speleogenesis. Caves are formed by various geologic processes and can be variable sizes. These may involve a combination of chemical processes, erosion from water, tectonic forces, microorganisms, pressure, and atmospheric influences. It is estimated that the maximum depth of a cave cannot be more than 3,000 metres (9,800 ft) due to the pressure of overlying rocks. 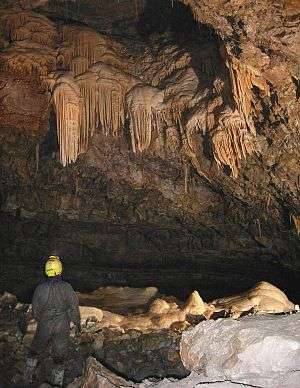 For karst caves the maximum depth is determined on the basis of the lower limit of karst forming processes, coinciding with the base of the soluble carbonate rocks. Most caves are formed in limestone by dissolution. Solutional caves are the most frequently occurring caves and such caves form in rock that is soluble, such as limestone, but can also form in other rocks, including chalk, dolomite, marble, salt, and gypsum. Rock is dissolved by natural acid in groundwater that seeps through bedding planes, faults, joints, and comparable features. Over geological epochs cracks expand to become caves and cave systems. 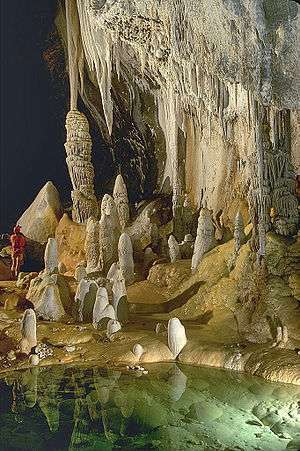 Lechuguilla Cave in New Mexico and nearby Carlsbad Cavern are now believed to be examples of another type of solutional cave. They were formed by H2S (hydrogen sulfide) gas rising from below, where reservoirs of oil give off sulfurous fumes. This gas mixes with ground water and forms H2SO4 (sulfuric acid). The acid then dissolves the limestone from below, rather than from above, by acidic water percolating from the surface. Lava tubes are formed through volcanic activity and are the most common primary caves. As lava flows downhill, its surface cools and solidifies. Hot liquid lava continues to flow under that crust, and if most of it flows out, a hollow tube remains. 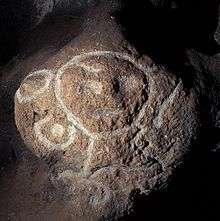 Examples of such caves can be found in the Canary Islands, Jeju-do, the basaltic plains of Eastern Idaho, and other places. 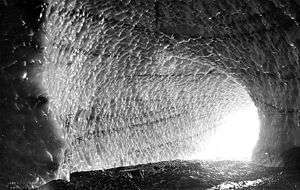 Kazumura Cave near Hilo, Hawaii is a remarkably long and deep lava tube; it is 65.6 km long (40.8 mi). 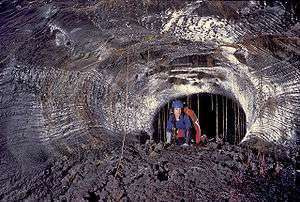 Lava caves include but are not limited to lava tubes. Other caves formed through volcanic activity include rift caves, lava mold caves, open vertical volcanic conduits, and inflationary caves. The cave system with the greatest total length of surveyed passage is Mammoth Cave in Kentucky, USA, at 652 km (405 mi). The deepest known cave — measured from its highest entrance to its lowest point — is Krubera Cave in Georgia, with a depth of 2,197 m (7,208 ft). This was the first cave to be explored to a depth of more than 2 km (1.2 mi). (The first cave to be descended below 1 km (0.62 mi) was the famous Gouffre Berger in France.) The Sarma and Illyuzia-Mezhonnogo-Snezhnaya caves in Georgia, (1,830 m or 6,000 ft, and 1,753 m or 5,751 ft respectively) are the current second- and third-deepest caves. The deepest outside Georgia is Lamprechtsofen Vogelschacht Weg Schacht in Austria, which is 1,623 m (5,325 ft) deep. The deepest vertical shaft in a cave is 603 m (1,978 ft) in Vrtoglavica Cave in Slovenia. The second deepest is Patkov Gušt at 553 m (1,814 ft) in the Velebit mountain, Croatia. ↑ Whitney, W. D. (1889). "Cave, n.1." def. 1. The Century dictionary: An encyclopedic lexicon of the English language (Vol. 1, p. 871). New York: The Century Co.
↑ "Cavern Geology" (PDF). National Caves Association. Retrieved 29 June 2016. ↑ "How Caves Form". Nova (TV series). Retrieved 2013-07-01. ↑ John Burcham. "Learning about caves; how caves are formed". Journey into amazing caves. Project Underground. Retrieved September 8, 2009. ↑ "Exclusive: Deepest Underwater Cave Discovered". ↑ "Is the Clearwater System the biggest of them all?". 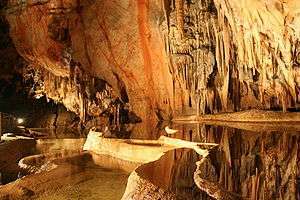 The Mulu Caves Project. Retrieved 19 November 2016. ↑ Owen, James (2009-07-04). "World's Biggest Cave Found in Vietnam". National Geographic News. National Geographic Society. Retrieved 2009-07-29. ↑ Olsen, Brad (2004). Sacred Places Around the World: 108 Destinations. CCC Publishing. p. 16. ISBN 9781888729160.